By middle of 1980 the Vauxhall Cavalier range covered a huge section of the mid-range car market, from the basic 1300L 2 door Saloon right the way up to the top of the range 2000GLS Sportshatch, with all the 1.6, 2.0, L, LS, GL and GLS variations in between. 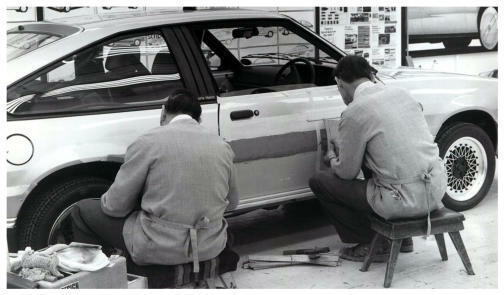 Work was also nearly complete on the U car replacement, the J Car, which would debut at the October 1981 Motor Show. Against this backdrop, and also the fact that Vauxhall had announced they lost £7m in 1979, it seems strange that the Company would spend probably the best part of £150,000 to produce a concept car based on a model that was just about to be replaced. For the rationale you need to dig a little deeper behind the scenes at what was happening within Vauxhall. The Luton Design Department, headed up by Wayne Cherry, had produced mock-ups for the 1980 Astra Mk1 and the Cavalier Mk2 with distinctive “Vauxhall” design differences to their Opel equivalents, in the same vein as had been done in the past with the Chevette, Cavalier Mk1 and Carlton Mk1. However, late in 1978 the decision was taken by General Motors Europe that the Luton Design Centre would become solely responsible for Bedford commercial truck design and all passenger vehicles would be fully designed and engineered by Opel in Germany and re-branded for the UK market as Vauxhalls. This did not become public knowledge until late in 1979 when it was announced Vauxhall would cease exports to mainland Europe – it would have been pointless trying to sell exactly the same car as Opel. 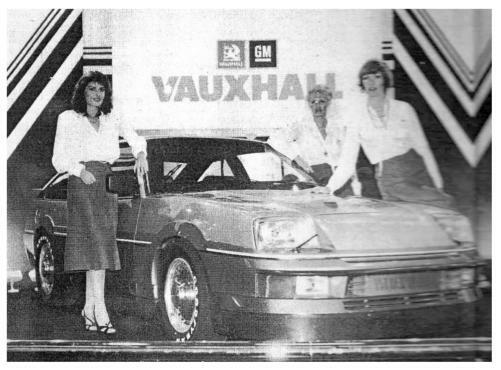 So the 1980 NEC Motor Show in October was the last chance to show something publically that Vauxhall’s Studio had designed and Wayne Cherry did not waste the opportunity one bit! Publically Wayne Cherry claimed the motivation behind the concept was that he wanted to take the Cavalier Sportshatch to its logical conclusion and this is how he and his team did it: The preliminary design sketches were done in March 1980 by a team headed up by John Taylor, Assistant Design Director, with the planned aim of the major parts of the design changes being able to be replicated as an after-market kit for customers to have retro fitted to their own cars. 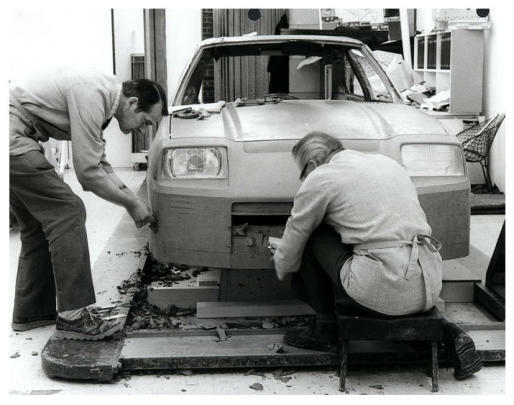 A new one piece fibreglass front end nose cone was fitted which extended forward the front of the car by 8ins compared to the standard Cavalier, not only did it transform the front appearance but also improved the aerodynamics over the standard car. The headlamps were standard with the addition of wash wipe but the lower spot lamps were covered by a clear glass panel stretching across the front of the car which also housed the number plate. The nose cone wrapped around as far as the front wheel arches where it was joined to another smaller panel that followed the arch round to the door post. There were neat extractor slots set into the trailing edge to draw excess residual air from the wheel wells and duct it along the smooth side of the car. The same principle was used at the front of the nose cone to draw air along the bonnet which featured a NASCA style duct to funnel air inside the engine bay just ahead of the turbocharger, then at the rear of the bonnet a row of angled slots for engine bay heat to escape. The rear wings matched those at the front with vents to improve airflow through the wheel arches. A revised door panel is fitted and below is the side skirting made from thick black steel reinforced rubber and and were similar to those fitted to the Black Magic Chevette. These act to draw air underneath the car and effectively hold the car down. To ensure they blend into the body-line special panels were developed. To round off the bodywork a rear valence spoiler was mounted below the bumper line and worked in conjunction with the tailgate spoiler to reduce rear turbulence. All these aerodynamic additions were not the result of a stylist’s whim or ”that should be all right” design rules, they were the culmination of many hours spent in a wind tunnel making tweaks and adding bits on or taking bits off. One serious flaw to the aerodynamic efficiency was the wheels, in the Design Studio the car was fitted with Compomotive split rims which in the wind tunnel ended up negating a lot of the gains from the bodywork modifications. The answer was to fit full cover disc trims, remember this is 1980 and the proliferation of full cover plastic wheel trims hadn’t happened yet, and once fitted the drag coefficient was just under 0.32 – in 1980, using a base car designed in 1973, it was spectacular. Another feature some years ahead of its time was the fitment of a Rajay Engine Management System to keep everything running as it should. The final part of the package was the interior, this started with Recaro front seats recovered in black leather and fully electrically adjustable via a push button panel at the side of each seat. The rear seats, door panels and parts of the centre console were also re-upholstered in the same black leather. Contrasting silver grey carpet was fitted, again edged in black leather. The various wear points, such as window winder handle surrounds, were faced with black Perspex with white graphics, electric windows were a surprising omission. The same white stripe used on the outside of the car was also used to divide the interior trim. A Voxson Tenvox stereo radio cassette with 4 speakers provided the audio pleasures – real 80s hi tech! Mechanically, the design team turned to ace Vauxhall tuner, the late and sadly missed, Bill Blydenstein. A standard 2.0litre CIH engine was shipped off to W B Blydenstein (Racing) Ltd at Shepreth who stroked the capacity to 2.4litres, fitted a big valve cylinder head and also fitted a Rajay turbocharger to give a power output of 150bhp. Another feature some years ahead of its time. 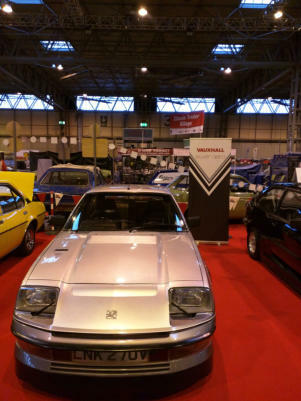 The Vauxhall stand at the 1980 Motor Show was light on crowd pullers, the Viceroy made its first public appearance along with the cut price Chevette ES and host of cheaper Astra models, so the Silver Aero was a bit of a bright spot. The public line from Vauxhall was that it was “exhibited to assess public reaction to the concept” and that existing Sportshatch owners would be able to upgrade their car with a three stage “kit” comprising 1> Interior, 2> body and 3> engine. Vauxhall claimed that there was significant interest but not enough to justify a production run of the “kit”. Looking back now it seems unlikely that, with all the work involved, the kit would have been a sales reality. I suspect the real reason for Silver Aero was to show what Vauxhalls Design Department were capable of, it was the last Vauxhall concept from Luton, the Lightening Concept was designed in Birmingham by Cadillac’s advanced studio so doesn’t count. It also proved Wayne Cherry’s credentials for his future roles in Europe and ultimately as President of GM Design worldwide. With the launch of the J Cavalier in October 1981 there was no Coupe offered, apart from Brazil's J car - the Chevrolet Monza – which offered a Coupe version, and the plan was to stop production of all the U Car variants, however Fords decision to revamp the Capri and continue with sales forced General Motors Europe to look at a cost effective overhaul of the U Car to compete. This included a fairly wacky body kit, designed under Gordon Brown, and the addition of a new 1.8 engine from the forthcoming Carlton Mk2. This meant the U Car, in Opel Manta, guise was able to soldier on until 1987 by which time Wayne Cherry had taken over as head of GM Design in Europe and he ensured the next Cavalier, the Mk3 had a proper Coupe derivative - the Calibra. The Car is in the hands of a Club Member and can regularly be seen at Car Shows. “Silver Aero” on display on the Vauxhall stand at the 1980 Motor Show. From the side only the windows clearly give the game away that the car underneath all the aerodynamic cladding is a Cavalier Sportshatch. 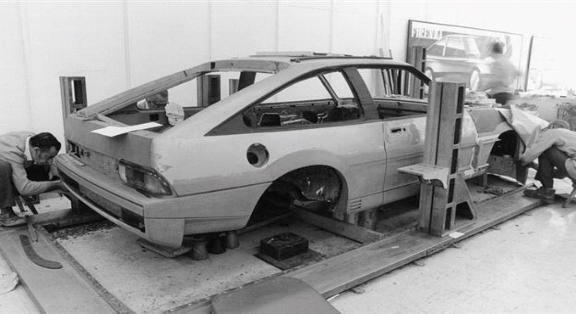 Craftsmen the Luton Design Studio working on what is basically a bare shell to start the transformation, strange to see a picture with the Firenza name on the wall in the background. An earlier picture than the 2 above where the front is being moulded in clay before taking fibreglass casts to produce the final nose cone. “Silver Aero” at the 1980 Motor Show at the NEC - Birmingham. 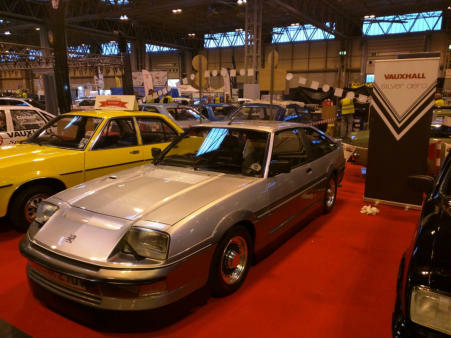 “Silver Aero” returned to the NEC Birmingham for the Lancaster Classic Motor Show in 2015 and appeared in Hall 3 the very Hall she was in back in 1980.